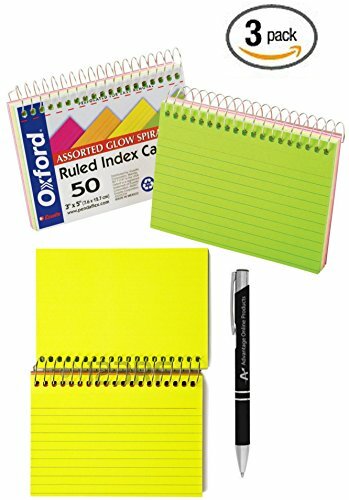 Value Bundle 3-Packs Oxford Spiral Bound Glow Index Cards, 3'' x 5'', Ruled, Asst Bright Colors, 50 Cards per Book (40281) includes Bonus AdvantageOP Black and Chrome Pen (40281x3+P) by Advantage Online Products, LLC at LDP Graphic Design. MPN: 40281x3+P. Hurry! Limited time offer. Offer valid only while supplies last. Oxford Glow Index Cards are ruled on one side for easy note taking. The 3'' x 5'' size is versatile enough for studying, presenting, and list-making. Oxford Glow Index Cards are ruled on one side for easy note taking. The 3" x 5" size is versatile enough for studying, presenting, and list-making. The handy spiral design keeps all your notes self-contained for easy reference. Each card has a perforated edge for easy removal of cards. Paper made from 10% recycled fiber with 10% post-consumer fiber. If you have any questions about this product by Advantage Online Products, LLC, contact us by completing and submitting the form below. If you are looking for a specif part number, please include it with your message.